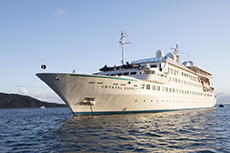 Special Promotions Available on 2019 Crystal Esprit Departures. In-suite iPads for entertainment, daily news, shipboard information etc. Yacht Cruise-Only Fares are per person in U.S. dollars, double occupancy and do not include cruise port, security and handling charges. All offers may not be combinable with other promotions, apply to first two full-fare guests in stateroom or suite, are capacity-controlled, subject to availability and may be withdrawn or changed at any time without notice. Optional Personal Select Air Program is available to purchase for full-fare, full-cruise guests whose travel originates from a U.S. or Canadian airport, and include all government fees and taxes. Solo Traveler Fares are available upon request.